My Internet subscription will stop on December 22, then in January I will move to my new house; after a relax period to recover the right energies, I will come back into action on several projects. Talking about OverTime, OverBox and Wasabi Devotion, but also two new projects (the soul band and the vocal group) that were frozen for too much time, and much much more! Stay in touch next year, and best wishes to all of you!!! An historic anniversary, an unforgettabile concert, a great crowd, many friendly faces: what more would you ask for? OverTime are back!! INFINITE THANKS to everybody who attended the show; a special thanks to Bandalarga and Marco Guzzetti who joined us on stage. 15 November 1988: first rehearsals session for the OverTime. many things happened since then, including some "forced interruptions" of the band's history; however, today the group still exists, stronger than any interference. For me it is and remains my first true and important musical group that I've been part of, regardless of its limited activity. Next Saturday there will be the birthday party for this band of friends, whose lineup is unchanged in twelve years; only one of the original members had left the game, and he will be at the celebration. Why you shouldn't be there as well??? I guarantee you won't regret it!!! I will soon prepare another set for a future streaming. Sat. 18/10/2008 (15:20) - OverTime is not over! While the new version of the group is forced to pause its project, next month we will have the chance to celebrate 20 years of existence for the mighty OverTime. A concert is planned (further details will follow), including old and new songs, with some friends joining us on stage. A fun night, not to be missed! It's been (and still is) a hard year, mostly because I'm very busy and stressed by my new house still under construction (not to mention the money going away for this "life project"), and some shocking epilogues of a few musical collaborations of mine. I wanted to exorcize all this by not telling the world all the details. Now I'm back because many of the things that were sleeping during the last two years are coming back to action with new energy, making me think that "the bad is bringing me some good", as often happens in life. And I should move to the new house within November!!! Next update won't be delayed like this one, I promise. 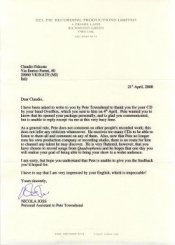 I just received Pete Townshend's answer to my postal package about OverBox: a letter signed (sigh!) by Nicola Joss, Townshend's personal assistant; you may read it by clicking on the thumbnail here on the right. Thanks anyway to Nicola and Pete; now the word goes to the band. Thu. 10/04/2008 (9:25) - It's springtime! Wasabi Devotion are out on records!!! One song (discarded by the trio during the development process) has been reworked by Big Mojo and included in his album "Ready Made", out on Irma Records; more recently, the Wasabi signature appeared officially for the first time with a couple of songs and a remix on the 5-CD box set compilation titled "The Nagual Vol. 1". The concerts for The Burpers are finally coming! One of these shows will be probably filmed for building a demo package. The pending project of a duo with a female vocalist has really started, at last; we are assembling the repertoire and we'll probably sing a song at a contest in mid-June. The unacceptable lack of activity on the OverBox side moved me to review the whole thing and my role in it, but also gave me an idea to give a sense anyway to what seems to become a "dead-end-street" project: I wrote a letter to Pete Townshend and put it in an envelope with a demo CD of "Who's Jimmy", sending him the packet as a tribute gift while asking his opinion about our work; if he will reply, that could be enough for saying that "it wasn't a total waste of time, money and energies", even if we won't do any real live "Who's Jimmy" show at all. Finally on YouTube: the TV videoclip of last December 21 (see previous news). Go there and watch! While I fight with digital movies and online video services, I uploaded the audio of my live execution of "Ain't No Mountain High Enough" with the SO Gospel Choir on TV dated 21 December 2007. Go to my MySpace page and listen! I don't want to talk much about the bad things which ruined the "soundtrack" of my 2007; I prefer to remember a few good things, such as my first time in theatre and my debut on TV, among other nice things. Now it's time to work for the new year, hoping that it will be hugely better than the previous one. Many concerts with The Burpers. Recording an album of my own songs, and assembling a soul band around it (or vice-versa...). A brand new intriguing project and a big cleanup of the pending ones. A few Wasabi Devotion songs out on records, and some new songs from the dynamic trio.